Ensure an enjoyable experience for partygoers with some strategic preparation. Try using these tips to make your event fun and your guests comfortable. 1. Heat your pool to a swim-friendly temperature. No one wants to swim in a cold pool, particularly when the mercury outside is on the low side. To tempt guests into the water, you will want the temperature to be around 85 degrees. To achieve this, be sure you plan ahead to run your pool heating system—possibly for a couple of days prior to your event if the pool is entirely unheated—to boost the temperature. Use a pool cover to help retain the heat being generated; if you don’t have one, consider buying an economical solar blanket for under $100. 2. Fire up your spa. If it simply too cold out to use a heated swimming pool, a spa—if your swimming pool has one—will almost always still be an option for friends and family. A hot bubbling whirlpool offers a different appeal from the pool: Some guests who wouldn’t consider getting into your heated pool will jump at the chance to soak in a 100-plus-degree spa with hydrotherapy jets. Heat spa water to between 100 and 102 degrees. During the party, make sure the maximum soak time is in the 15 to 30 minute range; less for children depending on their age. 3. Set a weather-friendly dress code. When writing your party invitation, include a message about party attire. Let guests know their comfort is important to you, and they are welcome to dress casual. You can also encourage them to wear warm jackets, shoes, and winter hats as desired. For guests who plan to swim in your heated pool: Remind them to bring thick bath robes and big beach towels. If they plan on their children swimming, it's especially important to pack clothing changes for them. If your party will feature a heated spa, mention this as well in the invite so that interested guests know to bring their swimsuits even if they had no interest in using the pool. 4. Light up the pool and deck area. If your party will continue into the evening, don't forget to illuminate the setting. Along with making your backyard look great, lighting creates a sense of warmth—even if it does not actually boost the backyard temperature. Turn on any landscape and pool lighting. If there are any rooms in the house with lighting that casts out into the party area outside, turn on those lighting fixtures as well. One reliable party favorite for accenting a backyard with light: tiki torches. They provide fun, warm party ambiance. Another popular option is a set of floating pool lights; the latest kinds include LED globes that change colors and integrate your pool into the party scene. 5. Warm your party area with space heaters and fire features. Outdoor electric space heaters come in a wide array of sizes, styles, and price points. If you have dined at an outdoor restaurant where these devices are used to heat patio areas, you have likely felt how well they work. Fire is always a hit with partygoers as well, especially when it’s cool out. Take advantage of any decorative flame features around your pool, such as fire bowls or integrated fire pits, by lighting them up. Your guests will particularly appreciate if you have the fire going in an outdoor fireplace, fire pit, or chiminea with nearby seating. Portable versions of theses hearth-type features can be found for $100 to $200 at hardware stores and online. And if you have outdoor grill or oven, partyers always love to gather around one for cozy conversation as they watch food cook. 6. Serve up warm comfort food. Speaking of food…certain kinds can warm guests’ stomachs and help them feel relaxed and cozy. Consider a hearty spread with offerings like chili, pizza, or lasagna. Or, offer a menu of spicy BBQ fare or ethnic cuisine like Thai or Mexican that will generate some internal body warmth. Drinks can also help warm up guests. Beverage options could include non-alcoholic holiday egg nog, hot coco, and hot mulled cider. If you are serving alcohol, consider a signature party cocktail that includes “heat” ingredients like chilies, ginger, or tabasco sauce. 7. Coordinate activities to keep guests moving. In crisp weather, some at the party won't even dip their toes in the water. So be sure to offer poolside activities for them, such as board games. Even better, arrange games that require movement to help guests stay warm. Depending on your group, physical games and activities could include a game like Twister, charades, or Secret Identity. You could also play music for dancing or hold a freeze dance contest. Make the most of your pool and patio area for entertaining. 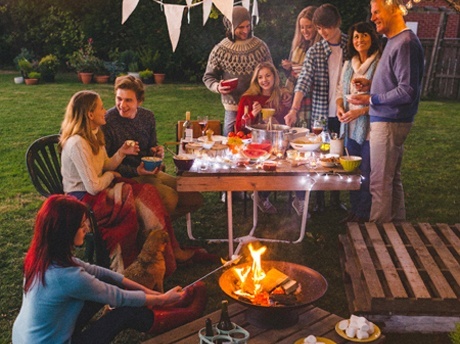 By using these kinds of strategies, your friends and family can extend backyard-living into the holiday season and even beyond.